Bentley is taking the Bentayga SUV to the famous ‘Race to the Clouds’ at Pikes Peak this weekend, as the British marque hopes to break the SUV record for the course set in 2014. 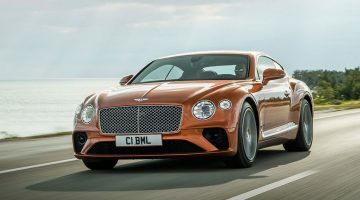 To help achieve its ambition Bentley has signed up no less than Rhys Millen, who brings invaluable experience as well as undoubted speed to the project. Millen can boast of two outright victories as well as 14 class wins at Pikes Peak. 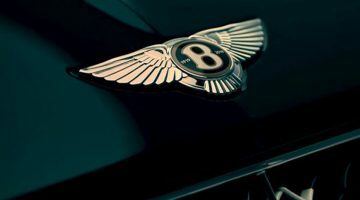 By signing for the Crewe-based company he becomes the seventh official ‘Bentley Boy’, a distinction reserved for drivers contracted to racing cars run out of the factory. 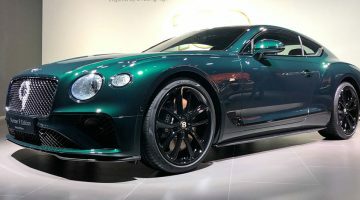 However, anyone expecting a mutant Bentayga with extreme horsepower will be disappointed: under the lurid satin Radium Green wrap of the Pikes Peak car is a standard production specification Bentayga, bar a few small details. Admittedly, some of those small details mean the loss of 300kg off the kerbweight, because that’s how much is saved by gutting the interior of its electrically-adjusted leather armchairs and thick carpeting. In their place is a full competition bucket seat for Millen and a very sturdy roll cage – the latter a necessity given the potential dangers of the Pikes Peak course, which rises to 14,000 feet with sheer drops down the mountainside as competitors climb higher up the course. Millen uses an oxygen mask to maintain concentration, and describes a run as “A pretty intense 10 minutes. I’d relate it to a single qualifying lap on a circuit”. The Bentayga will use a homologated road tyre and 22-inch wheels from the production range. The team will experiment with anti-roll bars and suspension settings, but gear ratios and engine power will remain untouched to preserve the link with the production car. Having been lent a road-going Bentayga out in the US, Millen has had developed his own, larger paddles for the eight-speed auto ‘box at Crewe; he’ll be driving the car in Sport and manual mode, and his own team will be leading the operation on the ground. For Bentley, the assault on Pikes Peak is a chance to test the Bentayga W12 in a way even their own testing programme can’t replicate, due to the constant acceleration and braking at high altitude. As such, the car will be covered with sensors to relay back essential information, particularly in terms of cooling and brake performance. Ironically, the part-gravel nature of the course previously would have aligned more closely with the idea of an SUV entering the event. As is, Millen is going to be putting a lot of faith in those giant carbon-ceramic brake discs as his two ton monster blasts up the hill.